Ms. Winking Snowy Owl Won 1st Place! Reston, VA (Feb, 2019) - Ms. 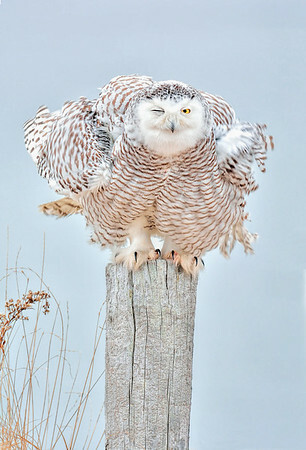 Snowy Owl won 1st place at the 10th Annual ArtSpace Herdon Fine Art Photography Competition. Over 180 images were submitted by 95 photographers in which 45 images were selected as finalists. The award reception was held at the ArtSpace Herndon on Feb 9, 2019 with a full house attendance. Jim Fenton is very humbled to be chosen as Best of the Best in his first competition and foray into the DC/MD/VA photography and art world. Jim has been highly awarded in local, regional and national Photographic Society of America affiliated competitions. The images he created have appeared in numerous publications including the Massachusetts and National Audubon Societies, the US Fish and Wildlife and numerous magazines. Psst... E&J Gallo! Hit us up if you would like your winking owl wine to have a new look in the near future!